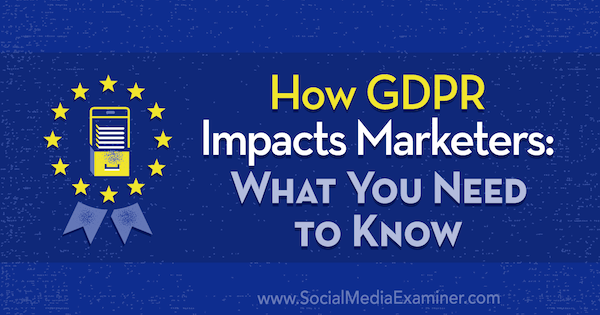 How Does GDPR Impact Your Marketing? The General Data Protection Regulation (GDPR) is a European Union (EU) law taking effect on May 25, 2018. GDPR is designed to give greater protection to an individual’s personal information and how it’s collected, stored, and used. There are strict requirements placed on companies that possess the personal data of people located in the EU. As the new GDPR regulations come into place, are you aware of the impact that it will have on your marketing? What can marketers do to ensure organisation compliance before the deadline date? A recent reports shows that 59% of businesses are still unsure of what they need to do and the changes that they need to make in order for their organisation to be compliant with GDPR’s new regulations. If you’re a marketer that regularly collects personal data through any means, there are steps that you need to put into place before 25th May. You should be aware of the fines that are associated with non-compliance of GDPR too. These could be as large as up to 4% of a company’s annual global turnover or €20 million, which will differ based on the severity of the infraction. A company does not have to be based in the EU either for these regulations to apply. If a company does business with another company that is within the EU, or has customers that are based in the EU, the regulations will also apply. GDPR is there to protect any personal data of individuals who reside in the EU. We love this article from Social Media Examiner that goes into depth of what changes will be needed from a marketers point of view – take a moment to read through and to get to grips with what is required. With all this in mind, it’s essential that all businesses, whether large or small, understand the new GDPR legislation and make the changes necessary to be compliant. But don’t panic, we are here to help where we can and offer support to all our clients when it comes to their online marketing and their social media accounts. If there’s anything else that you’d like clarification on, please feel free to get in touch and we will do our best to assist.